Combine traditional triceps toners with longextend moves like ball overhead reaches: Start with your shoulders and head on the ball, hips lifted, and hands over your chest. Bend at your elbows and slowly lower your hands back over your head (until your arms form a 90degree angle). Pause and return to start. Beginners can push hands together while advanced may keep arms apart. Perform 1520 repetitions, holding the last lift for 10 seconds at 45 degrees.Part two: From the final 45degree position, bend and extend your arms for a traditional triceps extension. Perform 15 repetitions and then bring hands back to chest. Repeat the set. Sitting on a Swiss ball strengthens your core and improves posture. Try these simple moves to tone your triceps and shoulders while you boost core strength and balance Seated ball triceps: Sit tall on the ball with your arms overhead. Beginners may place hands together, while advanced can keep arms apart. Bending at the elbows, reach behind your head and extend back to the top. Perform 2030 repetitions with light weights. Mini lift: Start sitting on the ball with your arms extending at chest height. Your hands should be together, back of wrists touching and thumbs pointing down. Lift arms from chest to eye height for 2030 repetitions with light weights, keeping your shoulders relaxed and down the entire time. Burning calories is key to having a sleek, toned body. Walking on an incline of ten percent or more can be intense, but try leaning forward and holding on to the handrails to incorporate an arm workout in your 3045 minute trek. Your rotator cuff muscles may be small, but theyre still an important part of stabilizing and shaping your shoulders. Try seated external rotation with tubing or free weights twice a week to tone and prevent injuries. Start sitting with your arm bent in a 90degree angle to the side, upper arm parallel to the ground. Without changing the bend in your arm, slowly lower the weight forward to 90 degrees and return to top. Perform 1215 repetitions with light weights and repeat on the other side. Resistance training is great for building strength, but stretching is essential for keeping your joints moving freely. Stretch your triceps by reaching one arm up and then behind your head, aiming for the middle of your back. Gently press on the elbow with the other hand and hold for 1030 seconds and repeat on the other side. Another great stretch Side neck stretch: Lean your right ear to your right shoulder, pressing with the right hand on the top of your head. Keep left shoulder down by reaching toward the ground. Hold for 1030 seconds and repeat on the other side. You can get an amazing workout with a resistance band, and it fits into any suitcase! Use this quick workout when youre on the road to keep those arms tight and toned Side tricep press: Start with the band across your chest with arms bent. Squeeze your shoulder blades together to keep your arms in place and extend one arm out to the side. Return to center. Perform 1520 repetitions on the right and then repeat on the left. Wide Ts: Hold one end of the resistance band in each hand and extend your arms at shoulder height in front of you. Squeezing from the upper middle back open both arms out to the side, forming a T with your body. Hold for 10 seconds and slowly return to center. Perform 1215 repetitions.Arm raises: Start with tubing secured by your left hip with your right hand and slowly raise left hand forward to shoulder height. Hold for 10 seconds and slowly return to center. Perform 1215 repetitions. Release the muscles surrounding your shoulder to help relieve sore muscles and neck pain. Hold a medium weight in your right hand in a forward bend position supported by the left arm. Relax the shoulders and slowly circle the weight from big to smaller circles. Repeat in the opposite direction from small circles to bigger. Repeat on the other side. Standing Pilates moves are great for your posture. Theyre best done with resistance bands or tubing, but youll still benefit without equipment.Pilates pulses: Start with tubing in front of chest and one arm stationary. Extend the other arm out to the side and do 20 pulses with each of the following hand positions. Palm down, palm up, and thumb up. Keeping your arms extended with tall Pilates posture the entire time. 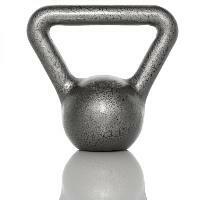 Kettlebell training uses acceleration and deceleration to generate more muscle tone faster. The swinging motion should always be controlled for safety and better muscle building. Try this cross curtsy row, which works the arms and lower body in one smooth step: Holding the kettlebell in your left hand, step back into a curtsy with your left leg and reach across and down with left hand. Stand back up with left foot to side and pull the kettlebell up and across the body. Perform 20 repetitions on each side. Sitting at your desk all day can be an opportunity to tone those arms. Keeping your legs lifted, roll your chair towards and away from your desk. This helps tone the lats and biceps, which surround the shoulder. Or pick up your laptop and raise it up and to the side. This targets the delts and obliquesa twoforone exercise. Perform 20 lifts to each corner.